We’re excited to launch a new series of Blessings on State Bed & Breakfast videos. Today we invite you to join us on our visit to the Jacksonville Farmer’s Market at Lincoln Square. Each time I post a video I’ll be sharing recipes and tips that come up throughout each segment. This week’s video segment includes visits with Yoder’s Meats and Triple Creek Farm. Preheat oven to 450 degrees. Line a rimmed sheet pan with aluminum foil. (Lining the pan makes clean-up a breeze!) 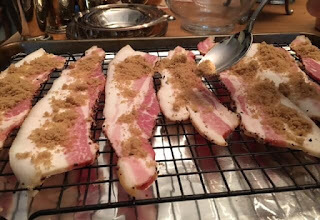 Place a sheet of parchment or a cooking rack over the foil. 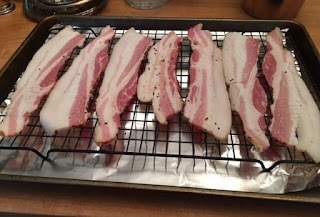 Arrange one pound thick-cut pepper bacon on your rack or parchment. Generously sprinkle with light brown sugar. Bake at 450 degrees for 15-20 minutes or until you reach the desired crispness. 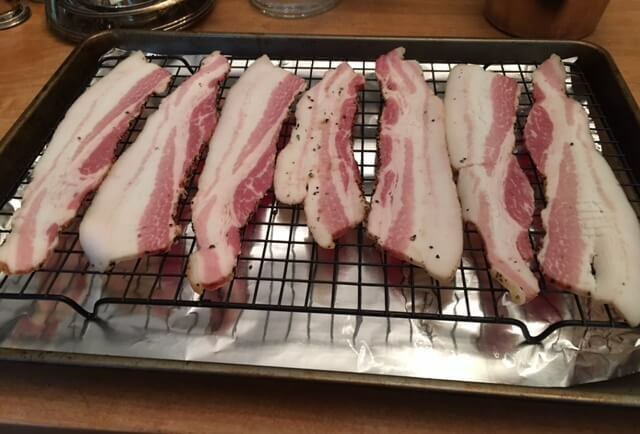 TIP: Using a rack makes the bacon crisper, by allowing the grease drip off as the bacon cooks. TIP #2: This freezes well, so I sometimes slightly under-bake and heat and serve at breakfast time. Find this terrific pepper bacon, ground Italian sausage and other meats at Yoder’s booth in the Jacksonville Farm Market at Lincoln Square. TIP: Use a power hedge clipper to trim and shape mums at least twice between May and the Fourth of July. Find beautiful mums like these at the Triple Creek Farm stand at the Jacksonville Farmers Market at Lincoln Square. Many thanks to Steve at Steve WebPhoto for his collaboration on this project. Experience a stay in our award-winning Bed & Breakfast located in a magnificently restored 130-year-old mansion in the heart of the historic district. Pampered luxury is our goal, to delight both business and leisure travelers. We offer two upscale guest suites, each with private sitting rooms and private baths. We provide multi-course gourmet breakfasts, 24/7 family-friendly hot and cold beverages and snacks, and cookies and milk at bedtime. Wi-Fi is available throughout our home and each suite has a digital satellite TV and all-season fireplace. We are located just steps away from Illinois College, the Governor Duncan Mansion and Illinois School for the Deaf and our neighborhood is highlighted on one of Jacksonville’s historic walking tours. Escape the standard hotel room and enjoy your own private suite in the finest Jacksonville area lodging.